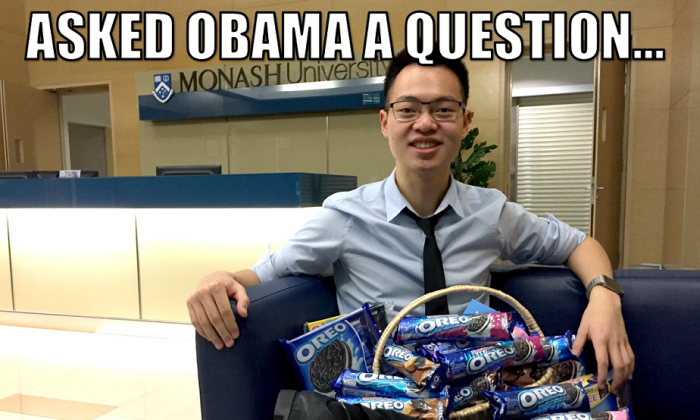 Last Friday evening, the internet was abuzz with Malaysians applauding Alphaeus Tan for daring to raise an issue to President Barack Obama that no one else did to during Obama’s ASEAN Youth town hall meeting at Taylor’s University Lakeside campus. Tan said, since Malaysia is currently involved political scandals, he hoped that Obama could raise the issue of transparency to the Prime Minister of Malaysia and encourage the notion of transparency and independence in the nation. 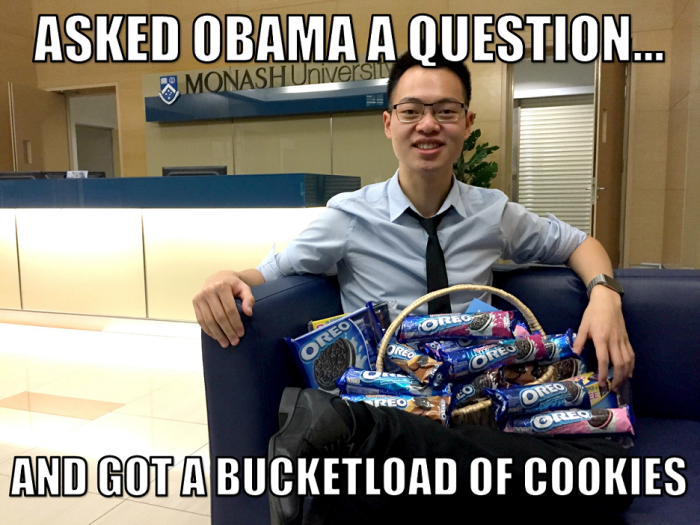 This post quickly became viral on social media with many people offering to “give him a cookie”. In general meme terms, this means that the person has said something of importance and he deserves brownie points for having the courage to speak his mind. Listening to everyone’s requests, Oreo Malaysia decided it was the perfect opportunity for the company to jump onto the band wagon. Oreo Malaysia hence decided to give Tan not just a cookie, but a bucket-load of cookies. Tan has decided to donate the Oreo cookies to the House of Joy, a charity home that administers shelter, care and training to orphans. Good on you Oreo. That gets a thumbs up from us at A+M. Does this mean you will see ice-cream ads on Facebook following your break up on WhatsApp?..